President Donald Trump and others have frequently blamed former President Barack Obama for a weak response to Russian election meddling in 2016 under his watch. Obama’s former chief of staff is now blaming Sen. Mitch McConnell for failing to sign on to a tough statement rebuking Russia, saying he was the one who wanted to water down the statement. Obama’s power on the Russia issue was reportedly limited in 2016. President Donald Trump loves to bring up former President Barack Obama’s inaction on Russian interference in the 2016 presidential election on Twitter, but now Obama’s former chief of staff is blaming one of the most prominent members of Congress for the administration’s lack of urgency on the matter. During an interview on NBC’s “Meet the Press“, former Obama chief of staff Denis McDonough said that while Obama had hoped to craft a strong bipartisan statement to rebuke Russia for its election interference activities during the 2016 election cycle, he was stifled by a lack of concern from leadership in Congress. “What I know is that the intelligence community approached the, the entire leadership of the Congress in early August 2016. Several members of that group did not take the briefing until early September 2016. Indication number one of a lack of urgency,” McDonough told host Chuck Todd on Sunday. McDonough’s assertion comes amid increased scrutiny on the Obama administration’s role in failing to prevent Russian election interference in 2016, and the criticism hasn’t just been coming from Trump. 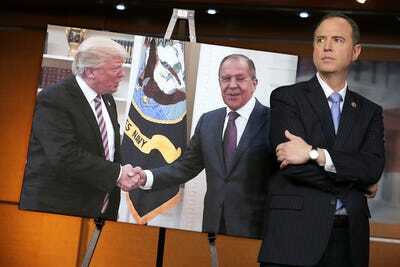 Ranking member of the House Intelligence Committee Rep. Adam Schiff admitted last month that Obama shouldered some of the blame. Even some of Obama’s own former advisers said they were at least partially at fault. But McDonough defended the former president’s record on the issue on Sunday. “Working with the information that we had, I think we’ve made a series of very important and very good decisions,” he told Todd. Obama knew about Russia’s election meddling efforts months before the election, according to Axios. In September 2016, Obama personally told Russian President Vladimir Putin at a G20 summit to “to cut it out,” referring to Russia’s interference campaign. And yet there was apparently little the president could personally do on the matter. It took some time for the intelligence community to issue a comprehensive report on Russian interference, and even then, McDonough said a lot of the onus to act rested with the states. McDonough said in terms of defending state election systems themselves, the Obama administration was able to effectively thwart Russian plans. Russian political operatives were still able to interfere in the election process through targeted ads, amplified divisive messages on social media, and the organisation of protests meant to deepen social chasms in the US. NBC News also reported in February that the US intelligence agencies had evidence that Russia-backed hackers compromised voter registration systems or websites in seven states, but never told the states. The US Department of Homeland Security denied the report.